Vince Staples’ new album Big Fish Theory, reviewed. On his new album Big Fish Theory, Vince Staples reunites hip-hop with the dance floor. 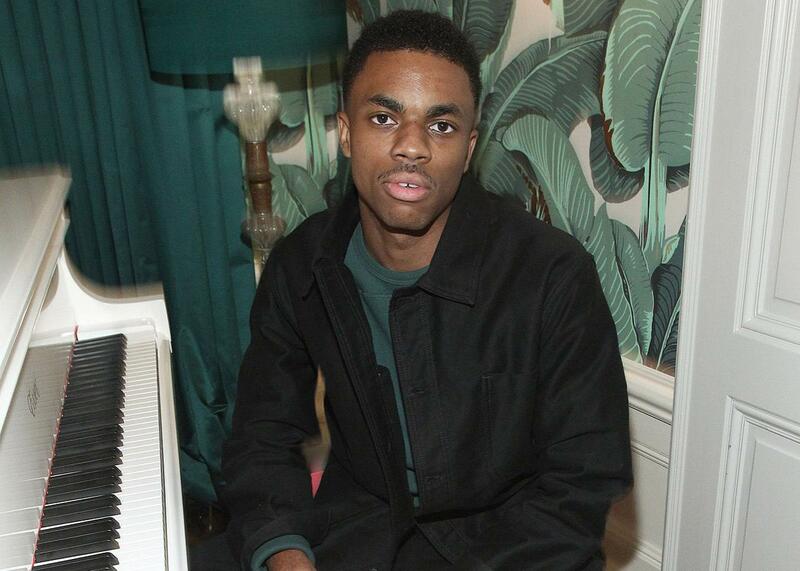 Vince Staples attends a Def Jam event on Feb. 12 in Los Angeles. The opening seconds of Vince Staples’ Big Fish Theory come on like a trance. A sound that seems to slide between a gust of wind, a police siren, and ambient tape hiss wheezes in the background as a synthesizer plays an ominous progression of minor chords that sounds like something Angelo Badalamenti might drop into Twin Peaks. Fragmentary, blinking tones come in, then a chirping, disembodied human voice. Justin Vernon is credited as a co-producer on the track, titled “Crabs in a Bucket,” but this certainly doesn’t sound like Bon Iver, at least not any more than it really sounds like anything. It’s a startling and transfixing introduction to an album that, by its end, a brisk 36 minutes later, has both confounded expectations and exceeded them. Big Fish Theory is an audacious and genre-defying work, a startling turn from Staples as we thought we knew him. For starters, it’s probably the most rhythmically sophisticated mainstream hip-hop release in recent memory. Big Fish Theory bears traces of Chicago house, Detroit techno, U.K. drum and bass, and a host of other genres and subgenres that in their 21st-century guises have been wrangled under the capacious acronym EDM, or electronic dance music. Tracks like “Homage” and “BagBak” pulse, rattle, and bounce; “Love Can Be …” boasts an honest-to-goodness, EDM-style build and drop; and the stuttering, syncopated tom-toms of “Party People” sound like something you’d be more likely to hear at Ibiza than on Hot 97. Big Fish Theory is only 12 tracks long, a little more than half the length of Staples’ 2015 acclaimed double-album debut, Summertime ’06. Summertime ’06 was mostly produced by Chicago legend No I.D. and was full of terse and percussive beats, the perfect backdrop for a rapper who seemed dedicated to dragging the L.A. gangsta tradition into the present and future. The album’s final track, “Rain Come Down,” sends it out on perhaps its highest note. The opening moments belong to the great Ty Dolla Sign, intoning the phrase rain come down in a weary auto-tune. Throughout the song, the meaning of the phrase seems to shift, from weather to bullets (“take a ride on my side, where we die in the street/ and the cops don’t come for some weeks”) to strip-club currency (“Make it rain in the club/ Don’t you dream on how it feels to be in love?”). By the time Staples’ last lines roll around—“What you drinking? Need a buzz?/ Don’t drown in the brown, just drown in the sound”—it feels like a mission statement for the entire record. Twenty-first-century hip-hop’s relationship to EDM—much like early hip-hop’s relationship to disco—has been complicated and imbued with thorny dynamics of race and class: There’s an unmistakable waft of moneyed whiteness that clings to these scenes, at least in their more spectacular public guises. But Big Fish Theory feels like a significant waypoint in the long-developing convergence of the two forms, a journey that’s lately been helped along by the futuristic Atlanta trap of Mike Will Made It and Metro Boomin, the ongoing musical midlife crises of Kanye West, and, most recently, the instrumental polyrhythmic collages of Indianan footwork producer Jlin, whose stunning sophomore album, Black Origami, released in May, feels like a sort of spiritual companion piece to Big Fish Theory. Listening to Big Fish Theory also offers a bracing reminder of the degree to which a lot of contemporary hip-hop has strayed from the music’s origins as dance music. I love Kendrick, Drake, and Future as much as (maybe more than) the next person, but there’s a reason young people are still ending their nights dancing to chestnuts like “Hypnotize,” “The Way You Move,” and “Gold Digger.” I’m not necessarily complaining about this, but Big Fish Theory’s emphasis on the bodily pleasures of the dance floor feels like a return to something fundamental, even if nothing else about this album feels remotely like a throwback. The image of the “big fish” usually conjures the setting of a small pond, but the one Staples is swimming in is absolutely enormous. Good thing, too, because he’s an even bigger fish than we thought.